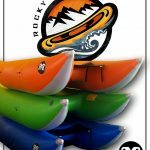 PRO River Outfitters is the first dealer for Rocky Mountain Rafts in the East! We are located in Southern WV New and Gauley River Country. 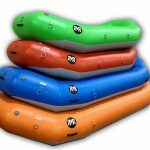 Rocky Mountain Rafts is a producer of commercial grade welded pvc whitewater boats at a price that most weekend boaters can afford. 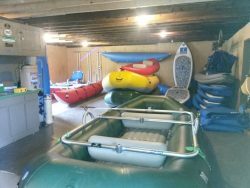 They currently make four sizes of selfbailing whitewater rafts – 10.5′, 12′, 13′, 14′, 16′ and 18′, two sizes of cataraft tubes – 14′ and 16′, a single and double inflatable IK and a paddlecat. RMR is one of only two importers whose pvc boats are welded rather than glued. There are three floor options, standard non bailing, I-Beam Self Bailing, and Dropstitch Self Bailing. The staff at PRO River Outfitters has decades of experience on rivers with AIRE, Sotar, Maravia, NRS, Achilles, Avon, Star, Demaree, Hyside, and others. In only a few years RMR has impressed us to the point of replacing our fishing fleet with new 14’ Rocky Mountain boats and are carrying the full line for retail sales. Warranties on all RMR boats are five years for private use and three years for commercial use. Raft colors are blue, gray, yellow, orange, red, green, dark grey, and lime for pre season orders. We mainly keep blue, light gray, green, lime and red in stock. The interiors (the thwarts and floor top) are gray. With a pair of RMR cataraft tubes, unlike every other brand, you get three air chambers per side instead of two. The base fabric inside the 44 ounce pvc is a very strong 2000 denier polyester, and wrap-up layers on the underside of each raft toughen them up even more! RMR uses the low profile Leafield D-7 valves throughout and most think they are the best valves in the industry. 2018 Arie 130 R w/ Down River Drifter "DEMO"